Grant of Ad-hoc Bonus to Armed Forces Personnel for the year 2016-17 : MoD Order, Ministry of Defence, D(Pay/Services), Subject: Grant of Non-Productivity Linked Bonus (ad-hoc bonus) to the Central Government Employees for the year 2016-17. ------- A copy of Ministry of Finance (Department of Expenditure) O.M. No.7/4/2014/E III (A) dated 19th September, 2017 on the above subject is forwarded herewith for information and necessary action in so far as Armed Forces personnel are concerned. Subject: Grant of Non-Productivity Linked Bonus (ad-hoc bonus) to the Central Government Employees for the year 2016-17. A copy of Ministry of Finance (Department of Expenditure) O.M. No.7/4/2014/E III (A) dated 19th September, 2017 on the above subject is forwarded herewith for information and necessary action in so far as Armed Forces personnel are concerned. 2. 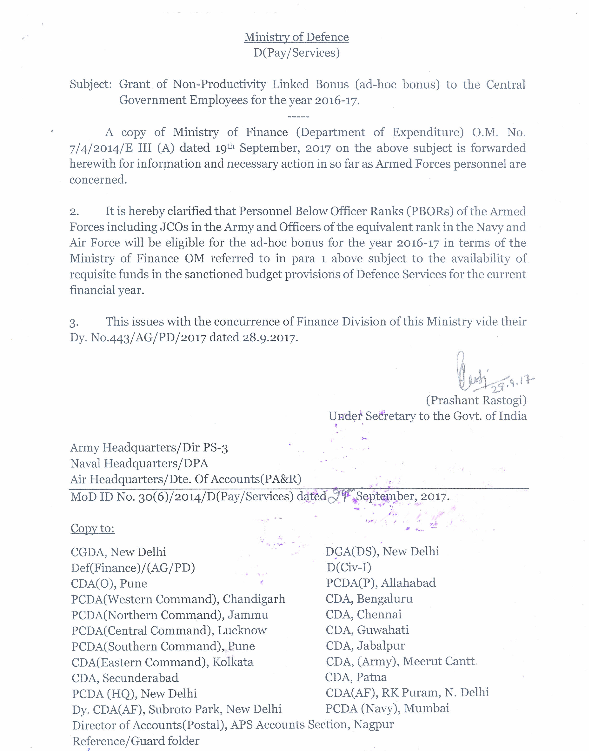 It is hereby clarified that Personnel Below Officer Ranks (PBORs) of the Armed Forces including JCOS in the Army and Officers of the equivalent rank in the Navy and Air Force will be eligible for the ad-hoc bonus for the year 2016-17 in terms of the Ministry of Finance OM referred to in para 1 above subject to the availability of requisite funds in the sanctioned budget provisions of Defence Services for the current financial year. 3. This issues with the concurrence of Finance Division of this Ministry vide their Dy. No.443/AG/PD/2017 dated 28.9.2017. MOD ID No. 30(6)/ 2014/ D(Pay/ Services) dated 29th September, 2017.